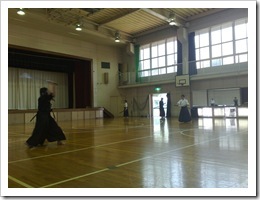 Summer has very definitely arrived and iaido practice has become a real test of stamina and endurance. Although not as aerobically challenging as aikido or karate, the controlled movements and constant rising from a seated position to standing, and back again is quite demanding physically. Especially for a gentleman of ..ahem.. a fuller figure and especially in 35 degree heat and 70% humidity with no air conditioning! Each class is three hours of fairly constant activity, and it is quite a challenge to stay focused and on the ball. But it is excellent training; in the heat and humidity, your brain is too overheated to get much involved in what you’re doing, so the body kind-of takes over – a sort of induced state of mushin where the technique flows naturally without conscious thought. Still – it has crossed my mind that I must be bloody bonkers! I’m no stranger to hard physical training, but I never thought it was possible to sweat so much in such a short space of time! In three hours I went through 1.5 litres of o-cha, and another 1L of sports drink. And none of it has reappeared in the form of wee! I’m also red raw from the chafing of a soaking wet dou gi But, for all the hardships, there is a sense of achievement from completing a demanding session. This is real Budo training – testing yourself in difficult conditions. And also – the Beerhound has earned his Dai Jocky of beer tonight!